Virtually every day, people are served with subpoenas to appear before a grand jury — and most have no grasp of what grand jury proceedings involve. On a basic level, if you have been called to testify, it means a prosecutor believes you have information that will support someone’s indictment on serious criminal charges. At the Law Office of Attorney Steven J. Topazio, we have extensive experience in both the state and federal court systems. We can fully explain your rights and obligations before you testify – in the effort to provide maximum protection of your interests. Contact us online to arrange a consultation or call . Your specific grand jury subpoena might be for proceedings associated with a federal or Massachusetts state investigation — involving allegations ranging from drug trafficking to business fraud. Whether or not you believe you have anything to hide, or that the prosecutor’s investigation in pursuit of an indictment could ultimately impact you, it is important to understand your rights and risks. We understand how disturbing and intimidating it may be to learn you are required to testify in grand jury proceedings. Our mission is to provide you with an experienced lawyer’s insight into your legal rights — and to be a valuable resource for you should you need further criminal defense counsel at any point. If you would like to discuss your concerns, please call our office or contact us online. 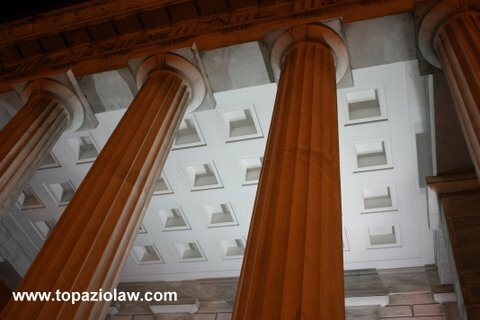 The client in this case was the wife to a defendant who was summoned to appear before the grand jury in relation to charges against her husband, hired Attorney Topazio to represent her. The wife wanted to invoke her spousal privilege under Mass. Gen. Laws ch 233, § 20 not to testify. Attorney Topazio pointed out that the statutory spousal privilege applied only to testimony in the trial of a criminal proceeding against the witness’s spouse and that grand jury proceedings were not trials. Attorney Topazio investigated the situation and discovered that the wife also had a Fifth Amendment right not to testify. The wife appeared with Attorney Topazio who refused to allow his client to testify based on the Fifth Amendment and spousal privilege. The judge who heard argument took the case under advisement. Today, the court ruled that according to the case of IN THE MATTER OF A GRAND JURY SUBPOENA, 447 Mass. 88; 849 N.E. 2d 797 (2006) the wife could not invoke her spousal privilege at the grand jury but agreed with Attorney Topazio and found she had a valid Fifth Amendment right not to testify. Result: Spouse not required to testify against her husband at grand jury.